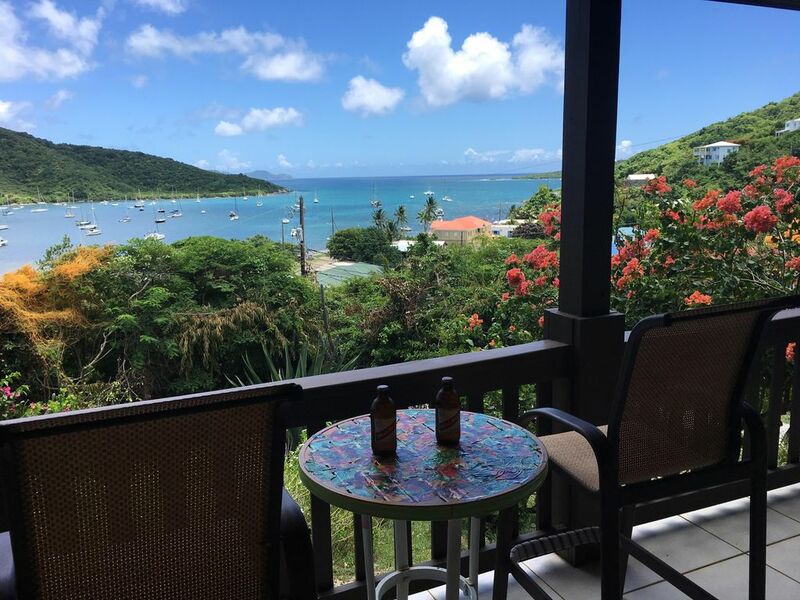 Coral Bayview is a quiet, deluxe, private studio apartment overlooking Coral Harbor with breathtaking views of the Harbor boat activity, 1000' lush green mountains, Treasure Island in the distance, and the open Caribbean sea beyond. With private entrance, Coral Bayview is self sufficient with king bed, A/C, kitchenette, and 100' wrap around covered deck. A 5-minute walk or 1-minute drive to 7 restaurants, 2 grocery stores, shopping, and sports rentals. A 4WD Jeep is also available. Completely reappointed since Hurricane Irma!!! Coral Bayview sits 100' above Coral Harbor off a paved street and enjoys magnificent views from your private deck, especially sunrise and moonrises. Upon arrival, a welcome basket greets you and includes your choice of a bottle of California wine, a six pack of your favorite beer, or 2 large bottles of sparkling water. Your first Caribbean continental breakfast is provided with our compliments and includes a loaf of freshly baked banana or mango coconut bread and freshly cut seasonal fruit. Coffee, tea, and condiments will be provided at no charge throughout your stay. East-West Catering adjoins the property and is often available for gourmet dinner room service for that romantic dinner served on your private deck. Ask to see Julie's room service menu and always ask what the nightly special is once you arrive. And stay safely hydrated right from the tap in your room. The rainwater collected at Coral Bayview passes through three stages of sophisticated equipment. It is the cleanest, safest, purest water you will ever drink. The studio is air conditioned with an additional ceiling fan but for those who enjoy the Trade Winds there are two screened sliding glass doors that provide cool breezes most of the year. The king size bed has a Deluxe Seely Posturepedic mattress covered with a pillow soft mattress cover and deluxe, soft, 500 count Pima cotton sheets and 4 deluxe soft king size pillows. Vertical blinds on both glass doors allow you to watch the sunrise from your bed in complete privacy or close them completely and sleep in. A Dohm Elite White Noise machine, recommended by The National Sleep Foundation will guarantee a peaceful nights rest. The walk-in closet contains a full size dresser and plenty of hangars. Even thought you only need a bathing suit and flip-flops, laundry wash, dry, and fold service is available on the property for a fee. The bathroom has a large walk-in shower with a private window overlooking the harbor. Complimentary shampoo, conditioner, body wash, and bar soap are provided as are 4 sets of ultra-soft bath towels, hand towels and wash cloths. Safety bars and skid tape in the shower provide added security. The kitchenette is equipped with a mini fridge with ice trays, microwave, toaster oven, coffee brewer with filters and mugs, electric tea kettle, wine glasses and opener, plates, bowls, forks, knives, and spoons, napkins, cutting board, paper towels, sponge, dish liquid and kitchen towels. The studio is equipped with a 40" swivel mounted flat screen HD TV with Dish satellite TV with Netflix. High speed wireless internet is provided at no charge as are several multi-port charging stations. (guests must bring their own adapters and chargers). The oversize wrap around deck has three sets of chairs to accommodate any mood. There are wicker chairs with a handcrafted wooden table from Fiji for morning coffee or reflection, hanging canvas chairs for reading or relaxing, and captains chairs to gain a commanding view of the Caribbean. Just beyond the deck are oleander, palms, bouganvilla, agave, and tamarind which occasionally attract donkeys, goats, sheep, birds and iguanas so keep your camera by your side. St. John IS paradise for active vacationers. And we provide everything you will need to maximize your enjoyment- Beach umbrella with sand screw, cooler with ice packs, flotation mat, beach towels, back pack, adjustable hiking poles, and beach chairs that double as backpacks to get you to those private beaches only accessible to adventurous hikers. We also supply you with numerous books and maps that offer clear, easy instructions on every beach, hike, and landmark on the island. Masks, snorkels, kayaks and more are for sale or rent at Crabby's Watersports; a one minute drive from the studio. And if you still have questions, our Property Manager will be happy to assist you. Julie Van Pelt is an award winning Executive Chef and owner of East-West Catering and she lives next door! When her schedule allows, she can create an unforgettable room service event that may include fresh fish and local organic produce. Vegetarian, vegan, and gluten free dishes are also available with the same creative excellence. A room service menu will be provided upon your arrival and don't forget to ask her if there are any daily specials not shown on the room service menu. For a separate fee, our Property Manager will pick you up at the Cruz Bay ferry dock and deliver you to the door at Coral Bayview. In addition, a 4WD, 2 door Jeep Wrangler hardtop is available for rent and will be waiting for you at your door. Jeep must be reserved in advance when booking. Ask for details if interested. You will have exclusive and private access to the studio via an outside, well lit stairway. The owners have a 2 bedroom apartment above the studio but are only on property about 3-4 weeks a year. Jack Brown, the Property Manager lives next door and is always available to assist you. He is already an Airbnb "Super Host" He is also the best auto mechanic on the island which is a massive benefit if you lock your keys in your Jeep or get a flat tire. The studio offers complete privacy and the Property Manager will only interact at your request. - SMOKERS ARE NOT WELCOME TO BOOK AT CORAL BAYSIDE. Please understand that this does not just mean that you can not smoke anywhere on the property, inside the studio or in our rental vehicle. If you are smokers WE WILL CONTACT VRBO AND YOU WILL BE ASKED TO LEAVE IMMEDIATELY without warning or notice. Additionally DO NOT invite any guests to visit you while staying at Coral Bayside studio that are smokers. We are completely serious about this issue so please be honest with us and look elsewhere for accommodations if you are smokers. We are committed to keeping our Coral Bayview studio pristine and a nicotine free space for those that enjoy a clean unpolluted environment. - Check–In is 3:00 pm and Check-Out is 11:00 am. If early check–in and/or late check-out is requested & available, a fee may apply. - Please plan to arrive in Coral Bay no later than 8:00 pm. If you are arriving after 8:00 pm, please contact us in advance to make arrangements. - Please help us conserve water! Everyone on St. John gets all of their water from rainfall collected from the roof in large tanks under the house so we ask that you be conservative with your water usage. Our water, unlike most other rentals, is treated by dual filtration and ultra violet light to kill any bacteria and is perfectly safe to drink. - Please conserve electricity! Electricity in the Virgin Islands is several times what it costs in the States. Please be mindful of electricity use: turn off all lights, fans, fountains and A/C when not in the studio. Your conservation allows us to offer you such reasonable rates. - 2 large folding luggage racks are provided for your use. All luggage must be placed on these racks. Never on dresser, bed or floor. - Please do not leave any food out in the open either on the deck or in the studio. Place all open, non-refrigerated items in the Ziplock bags provided and any refrigerated items in one of the two mini fridges. -We provide a microwave and toaster oven in your kitchenette but we do not allow ANY open flame cooking devises to be used inside the studio. - We provide you with a covered plastic trash bin. Please tie up your trash bags provided and place them in the covered bin making sure the lid is secure. We will dispose of your trash for you daily once you bring the full bin to the top of your stairs. - Please hose off all beach and sandy gear at the top of your stairs. Sand is a very precious natural resource and should be left on the beach. There is a hose provided at the top of your stairs for your use to wash your beach chairs, feet and any sandy gear. Please hang up your beach towels and swimwear on the clothes line down stairs or drying rack provided. - We provide 4 large plush beach towels. Do not take the white bath towels to the beach. - We urge you to make use of the St. John guide books provided, but please do not take them out onto the beach or on the water with you. - ABSOLUTELY nothing in toilet but toilet paper. No feminine hygiene products or any other paper items or foreign objects. There is no municipal sewage systems here on St. John to flush into. Instead every home has a self contained sewage treatment system. These systems are eco friendly and very sensitive and do not tolerate anything but waste and toilet paper or they will malfunction and back up. Trust us, not something you ever want to experience. - ABSOLUTELY nothing down the bathroom sink as well. Same system as above. -While you will enjoy total privacy on your own deck your hosts also live in the building so we ask that you be considerate and keep the noise levels down. If you want to get wild and loud please visit one of St. John's nightspots. And finally, if you are wanting free dog love feel free to let our dog Kai on your outside deck but he is not allowed inside the studio. Betty Ann and I are recently retired. We have owned our home in Coral Bay for 8 years and have enjoyed it immensely (as will you). Betty Ann raised two kids who are now an attorney and a PhD candidate; and I spent 40 years in the industrial chemical business. We like to travel, mostly to warm places but it is hard to beat St. John. With 3 grandkids living in Colorado, we commute back and forth from Denver a lot. We have a long history of community service thru our church, YoungLife Youth ministry, and The Caribbean Youth Network. Although we are new to VRBO, our ON-ISLAND Property Mangers, Julie Van Pelt and Jack Brown are neighbors and Superhosts. They have 17 years of experience as residents of St. John and Julie operates an award winning catering business (East West Catering). She has a room service menu in Coral Bayview should you wish to sample her cuisine. She also speaks conversational Spanish, French, and Norwegian for our International guests. Together, Jack and Julie can take care of all of your needs and answer any questions you may have about the island of St. John including beaches, hiking trails, best snorkeling spots, dining and shopping. Of all tropical destinations we have visited, none come close to St John. Twenty beaches and 22 hiking trails. With just a 15 minute hike along most of the shaded trails you can end up on a beach with few if any other people. The snorkeling is second to none. Crossing paths with 7 foot nurse sharks (they are harmless) or 15 foot wingspan eagle rays is the best. Betty Ann and I have rented many houses on St. John prior to purchasing a home. And since purchasing this property we have hosted dozens of friends and relatives. We all agree that being close to the harbor is a huge plus. The view from the mountain top properties is beautiful but the view looks like a postcard, no movement. Being closer to the harbor allows us to watch the boats coming and going; donkeys, goats, and horses meandering; and cormorants, egrets, frigate birds and pelicans surveying the water for dinner. We also enjoy occasionally walking to our favorite haunts; Skinny Legs, Oasis, Aqua Bistro, and Indigo Grill. And we can pick up groceries or beer with a one-minute drive. Jack met us at the ferry and Julie welcomed us to the studio. Everything was clean, well organized and ready for us. We rented a Jeep from them for the 10 days. It’s really needed if you want to explore. It reliably got us to some obscure places. (Check our little Lamesure beach). We sampled one of Julie’s gourmet dinners and it was amazing. There is a constant breeze that makes A/C unnecessary. Sit on the porch and enjoy the experience! After midnight it’s good to close the doors and block out the night noises. There are several good Caribbean style restaurants in walking distance. Check out was easy and Jack returned us to the ferry. Great hosts, great atmosphere. Just let it in! If you’re thinking of staying on the Coral Bay side of St. John ... book this place! Coral bay view studio is just about perfect! Centrally located to all the great places to eat on the Coral Bay side of the Island like Skinny’s, Rhumb line, Pickles, Aqua Bistro, Isolo etc. If you want a true taste of life on St. John and do not want to feel like a tourist then the Coral Bay Area is for you. The studio apartment is quite roomy. The bed was extremely comfortable with nice linens, pillows and comforter which is so crucial when away from home! We were there in the beginning of March and didn’t need the AC. We slept with the cool ocean breeze as it came in through the large sliding glass doors. The porch is lovely. Very spacious with a beautiful view of Coral Bay. I watched the sun rise almost every morning with a book and cup of coffee. The studio comes equipped with everything you could need for your excursions on the trail and to the various quiet bays nearby. Beach chairs, coolers, beach towels, floats, snorkeling equipment, hiking backpack etc. Coffee and tea, microwave, toaster oven, fridge, etc. were also useful and we were glad to have them. Julie and Jack were extremely helpful. Jack gave us a great tour of the island when he came to pick us up from the ferry and Julie offered dinner as an option most nights. We ordered lobster one night through her catering business and everything was delicious and cooked perfectly! We rented a Jeep through them too which was so convenient. Jack is an official Jeep mechanic so that too gave peace of mind while driving the roads on St. John! I had mixed feelings with this review... happy to give a good review but also don’t want everyone finding out about this fantastic little place in Coral bay. Every day we spent in St John was pretty much perfect and we hope to be back next year! My New Husband and I stayed with Jack and Julie in December and had a more than Awesome time. We have memories that will last us forever! My favorite memory is waking up every morning by the Sun shining through the big sliding glass doors, breathtaking! We stayed in the Studio apartment on the right side of the house. Everything was very well thought out in the Apartment. It has a very big closet so all your travel gear can be out of the way. The studio is well equipped with everything you need and more. From bug stray, to coffee, from walking sticks to a small frig, from books about the history of the island to binoculars. All came in great use! The bed was super comfy which I believe is one of the most important things to have in a rental. And the outside area was private and we had tons of laughs looking at all the goats, donkeys, and chicken running around. They are so cute! Jack was a great, informative host. Jack picked us up from the ferry the afternoon we arrived and took us on a Jeep tour of the island on the way to the house on the east side. Very informative to know where all the Beach accesses are and where to go and what to do. Driving on the island is an adventure in itself! Remember to keep left and watch for donkeys! Julie was a very nice host. My husbands bag got dropped in the water from off the ferry (which never happens) she was nice enough to wash his clothes and folded them, even his undies haha.The Mango Coconut bread was so amazingly tasty and she's made us Fish Tacos one night and sat out on the porch and enjoyed the beauty of the bay and the delicious homemade dish! The beaches on the island are all so unique and beautiful in there own ways. I honestly couldn't say I liked one more than the other, cause they were all their own vibes and greatness! The trip was definitely a dream come true. Can't wait to visit again one day and hop around to different Islands in the area. Had a great time, ordered in a few times. Convenient drive anywhere you need to go. We even rented to Jeep with the property which saved us $$$ and made it super convenient to get car and turn car in. Our daughter loved watching the goats and horses feed out in front of the cottage everyday.